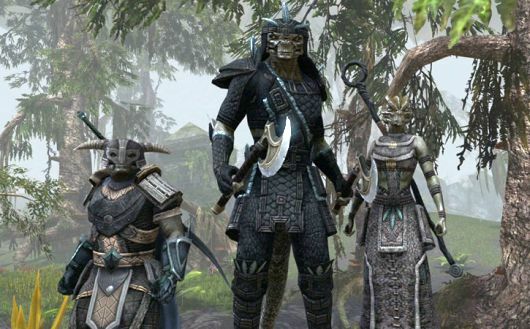 The Elder Scrolls Online is going to feature combat, which should come as a shock to precisely no one. But how is that combat going to work? How important will the holy trinity be in practice? How ornate will your attacks and counterattacks be? These and more are all excellent questions, and they’re also questions that have been answered in the latest installment of community answers over on the official site. And that’s only a small fraction of the information. At the moment, the trinity setup is not vital but is certainly helpful, as tester groups without a dedicated tank have managed to clear content (albeit with some difficulties). The soft lock system is based more around offense than defense, as healing abilities are not targeted. Players can also feel free to join in when they see other players fighting things, as all players who participate gain the rewards of fighting as in Guild Wars 2. For more information about the particulars of combat, check out the full set of answers. I think what we have here is another “Rift”. By that I dont mean a game with a great class system, or any other similar game mechanics. What I mean by that is this: For everyone who has long been done with WoW or any other long term game, they now have a new game to play, that while it may not be super amazing, also probably wont be amazingly horrible either. It doesnt matter if its similar to any other specific mmo from the past. What matters is that its something new to play. The mmorpg market has been stale for far too long now, and anything that can give gamers even 6 months of something feeling “different” or “new” is often better than playing nothing at all. Call them “filler mmorpgs”. Games that exist between the major block busters, that are successful not because they are great games, but because they are a quick breath of fresh air in a genre that gets stale after playing and older game for 5+ years. The industry needs to learn that the “players” are the game – not the content. I believe TES:O is rehashing too many old systems and not bringing ANYTHING new to the table. There are TOO MANY systems in place currently within TESO to funnel the players through a progression/leveling/skill vacuum tube. Am I excited to play the game for 3 to 6 months, cancel my sub and then pick it back up after a year or two for another 2 month stint, and then cancel again? Certainly… However, I’m fairly certain that western developers need to focus on PLAYER driven and generated content, quit with the space monkey theme-park approach, and stop shooting for 2mil+ subs – as its not going to happen. Budgets need to come back in-line with games that would be happy having 500k loyal subs for a few years, as opposed to the astronomical numbers that the suits are spending hoping they can triple their money over the long haul. Open a level 50 dungeon up to a level 12 player, let em get squashed if they want. Give players the option to make 9 different progressive levels of lanterns/torches/magical light sources so they can see in the darkness – or be eaten by something nasty that they can’t see coming on an overcast moonless night in your mmo – otherwise GTFO of the industry, as you are dead weight pulling the rest of the visionaries and real developers not out for a pure cash grab down.